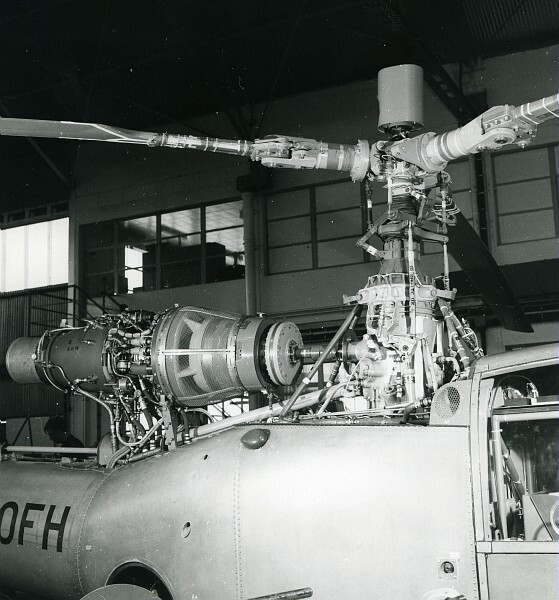 7 April 1967: The prototype Sud-Aviation SA 340 Gazelle, c/n 340.001, F-WOFH, made its first flight at Marseille–Marignane Airport owith test pilot Jean Boulet. 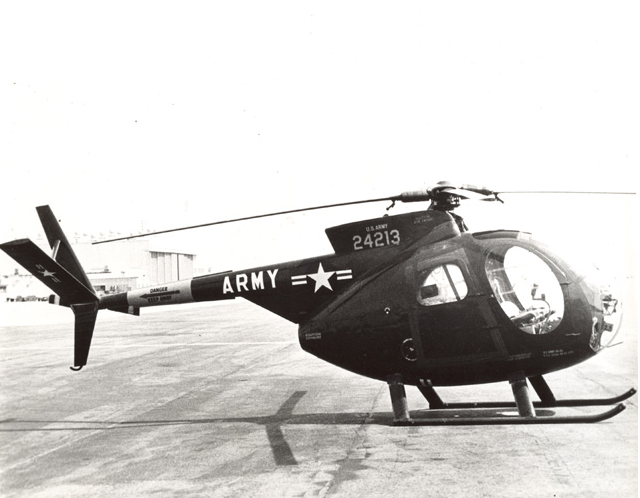 The SA 340 was a five-place, light turboshaft-powered helicopter, flown by a single pilot. 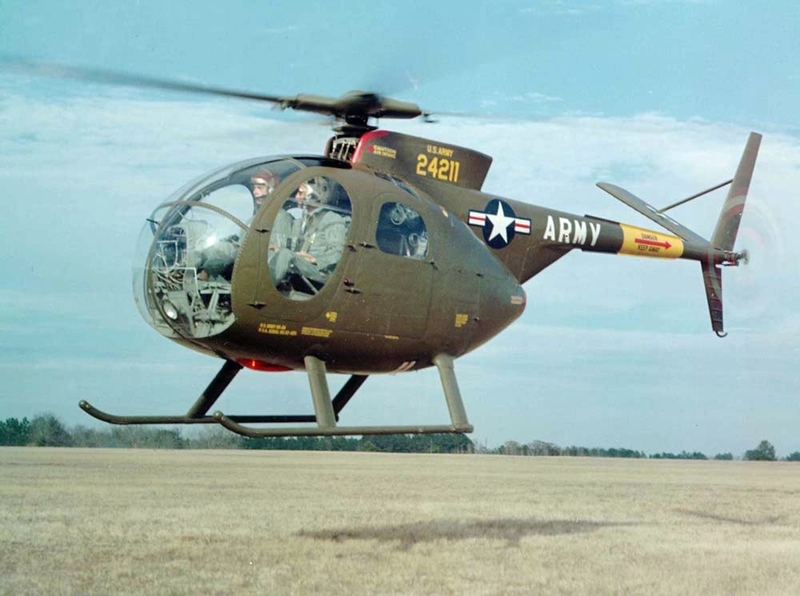 It was intended as a replacement for the SA 313B/318C Alouette II and SA 316/319 Alouette III. 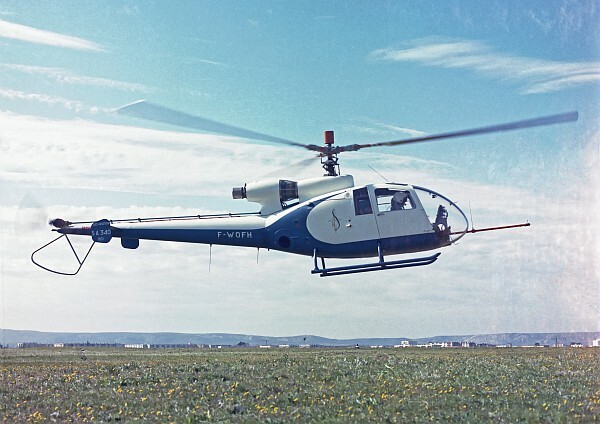 The prototype used the engine, drive train, tail rotor and landing skids of an Alouette II, and a new three-bladed, composite, semi-rigid main rotor, based on the four-bladed rigid rotor of the Messerschmitt-Bölkow-Blohm (MBB) Bo-105. Société nationale des constructions aéronautiques du sud-ouest (Sud-Aviation) was a French government-owned aircraft manufacturer, resulting from the merger of Société nationale des constructions aéronautiques du sud-est (SNCASE) and Société nationale des constructions aéronautiques du sud-ouest (SNCASO) in 1957. 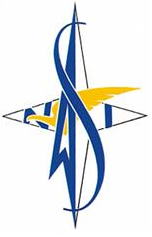 In 1970, following another merger, the company would become Société nationale industrielle aérospatiale, or SNIAS, better known as Aérospatiale. This company combined several other manufacturers such as Matra and Messerschmitt-Bölkow-Blohm to become Eurocopter, then EADS. It is now Airbus Helicopters. 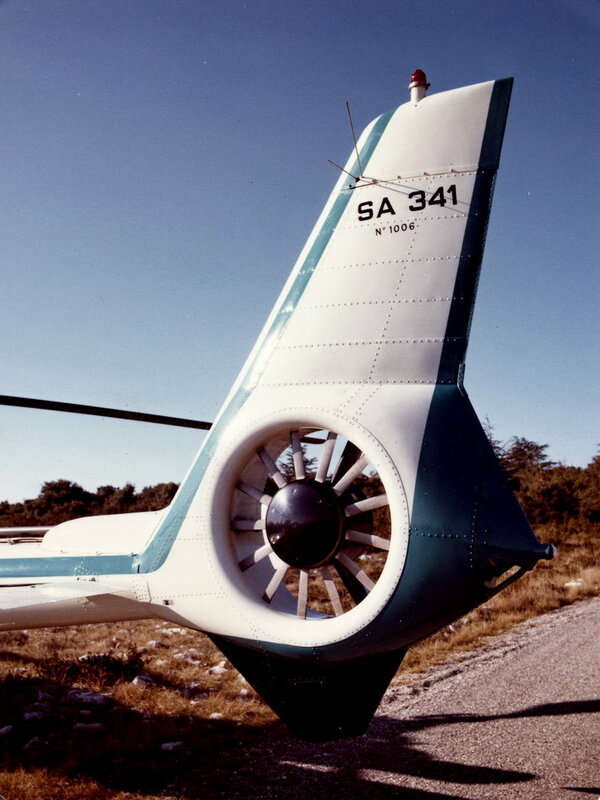 The SA 340 was powered by a Turboméca Astazou IIN turboshaft which turns 42,500 r.p.m. (± 200 r.p.m.). The output shaft speed is reduced through a 7.34728:1 gear reduction. The engine rated at 353 kW (473 shaft horsepower) continuous, or 390 kW (523 shaft horsepower) for takeoff. It is temperature-limited to 500 °C. for continuous operation, or 525 °C. for takeoff. F-WOFH was used to test the new fenestron anti-torque system. 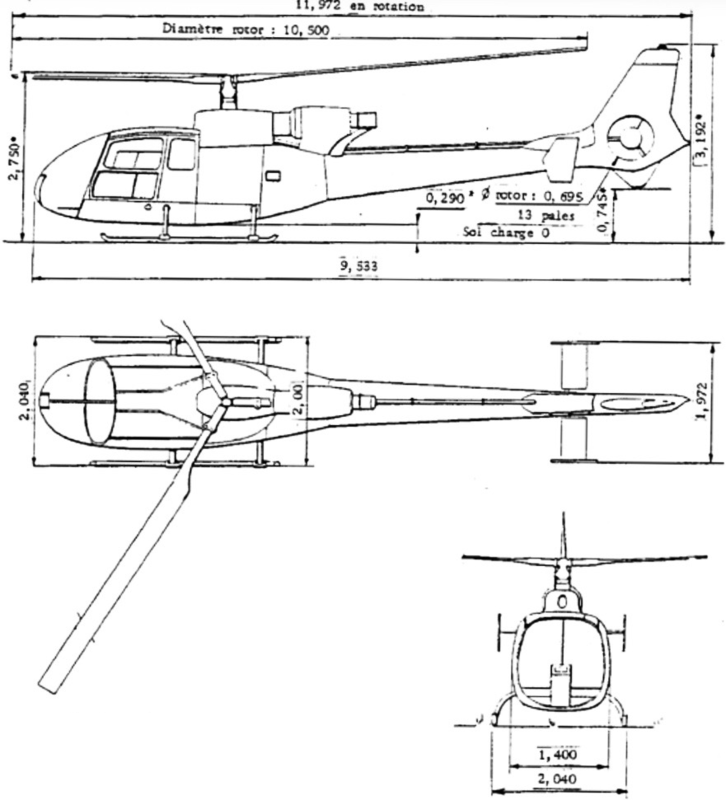 The conventional tail rotor was replaced with a smaller 13-bladed ducted fan contained within a large vertical fin. 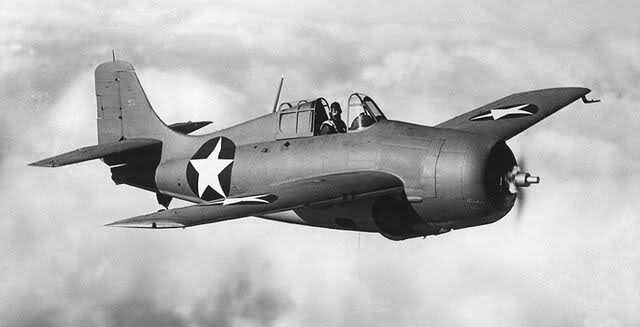 The fenestron had several advantages: It was safer, as it was protected from ground strikes or from ground personnel walking into it. It was more effective in producing thrust for anti-torque, though it required more engine power at a hover. It reduced the aerodynamic drag of the helicopter in forward flight, and was not subject to large displacements resulting from dissymmetry of lift. The large fin was cambered and relieved the anti-torque system during forward flight. This meant that the helicopter could be flown following an anti-torque failure, rather than requiring an immediate emergency autorotation. 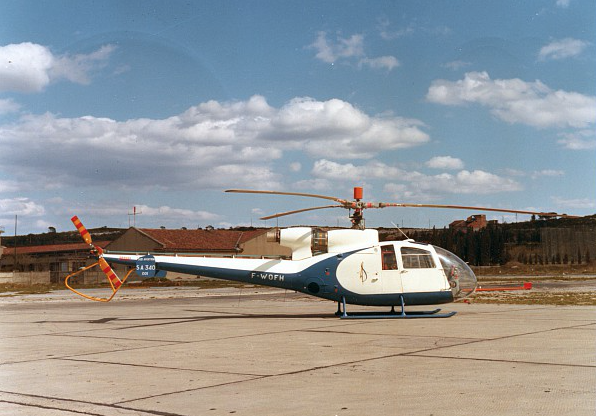 The Aérospatiale SA 341 Gazelle entered production in 1971, as both a military and civil helicopter. The aircraft was also produced in England by Westland. 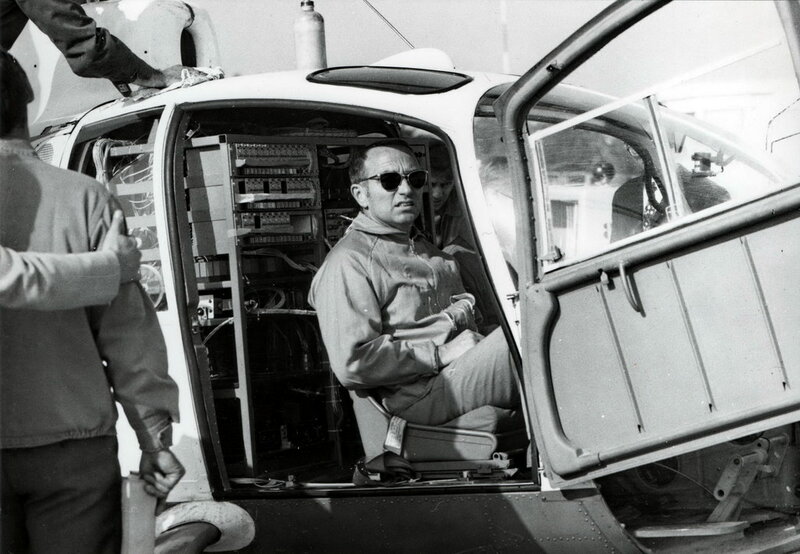 The Gazelle the first helicopter to be certified for instrument flight with a single pilot. 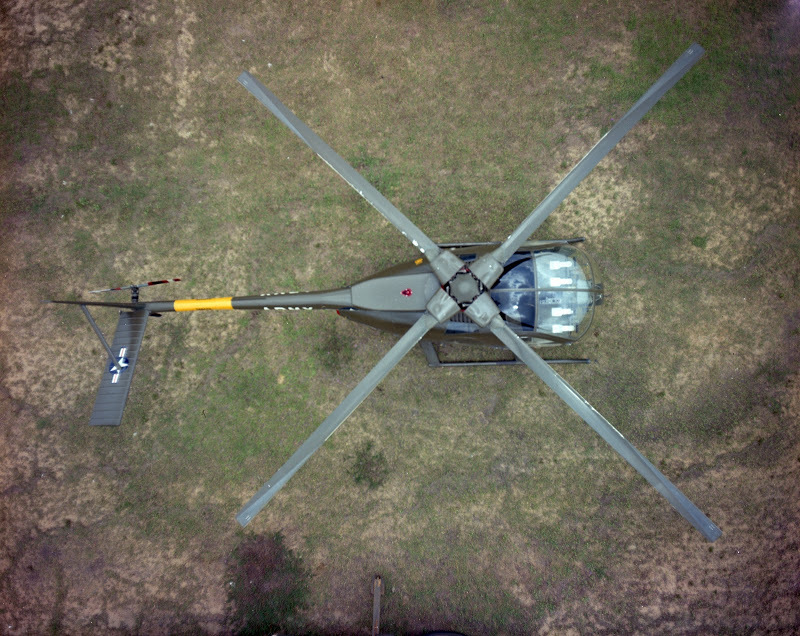 The helicopter’s certified maximum gross weight is 1,800 kilograms, or 3,970 pounds. The Gazelle is powered by a Turboméca Astazou III. Approximately 1,775 Gazelles were built between 1967 and 1996, when production ended. 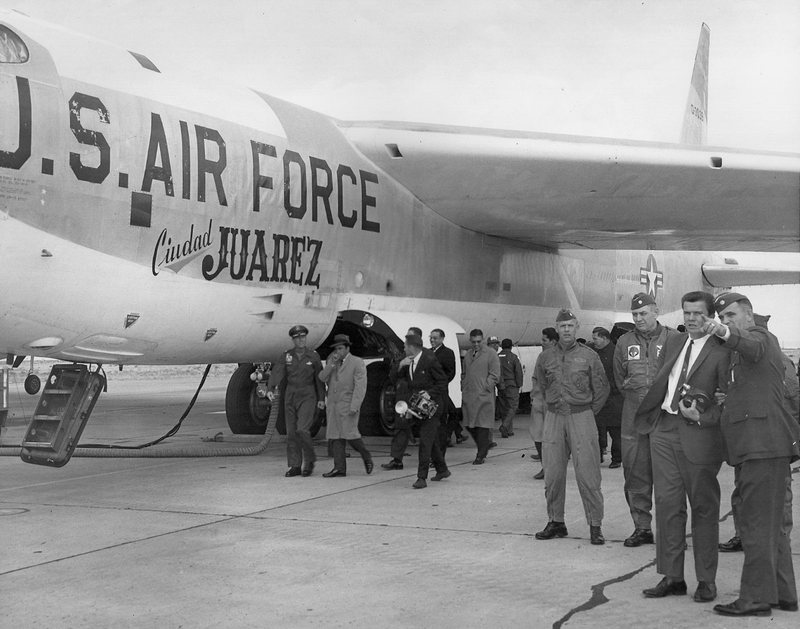 7 April 1961: Boeing B-52B-30-BO Stratofortress 53-380, assigned to the 95th Bombardment Wing and named Ciudad Juarez, departed Biggs Air Force Base, El Paso, Texas on a training mission. 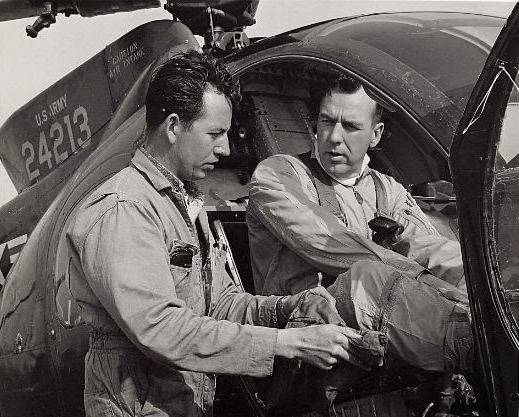 The aircraft commander was Captain Donald C. Blodgett. 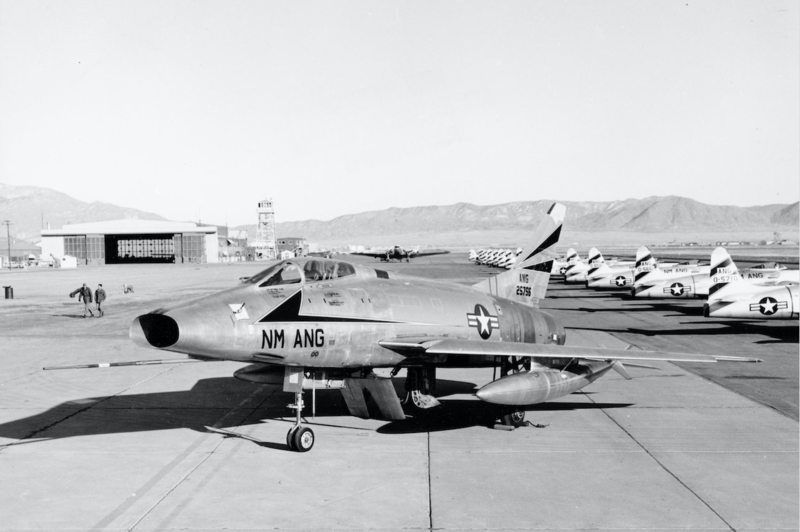 The flight took Ciudad Juarez over New Mexico where they were intercepted by a flight of two North American F-100A Super Sabres of the New Mexico Air National Guard, also on a training flight. 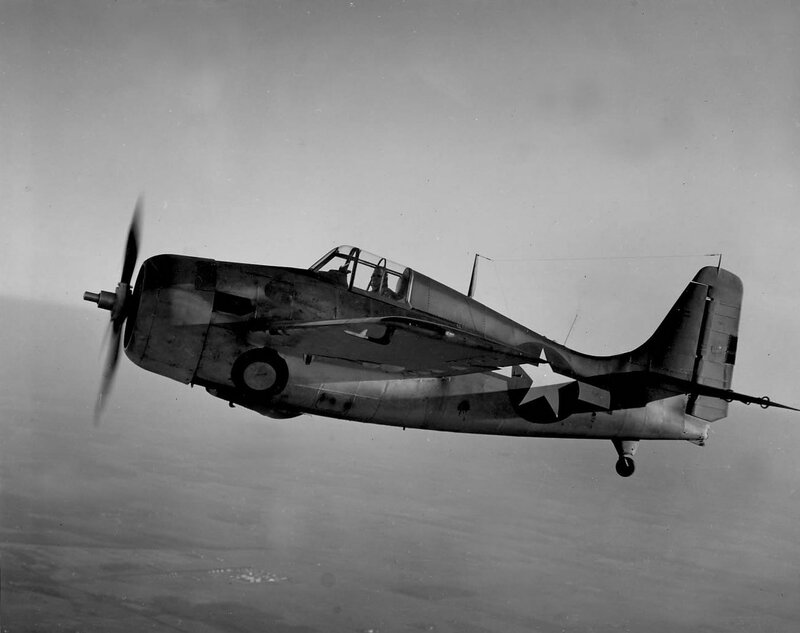 Captain Dale Dodd and 1st Lieutenant James W. van Scyoc had departed Kirtland Air Force Base, Albuquerque, New Mexico. 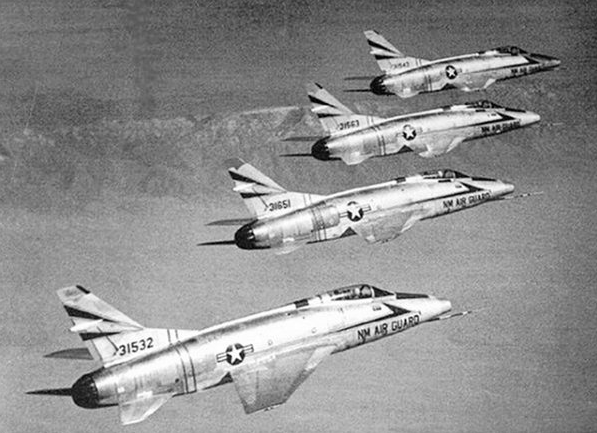 Each of their Super Sabres were armed with two GAR-8 Sidewinder air-to-air missiles (later redesignated AIM-9B Sidewinder). 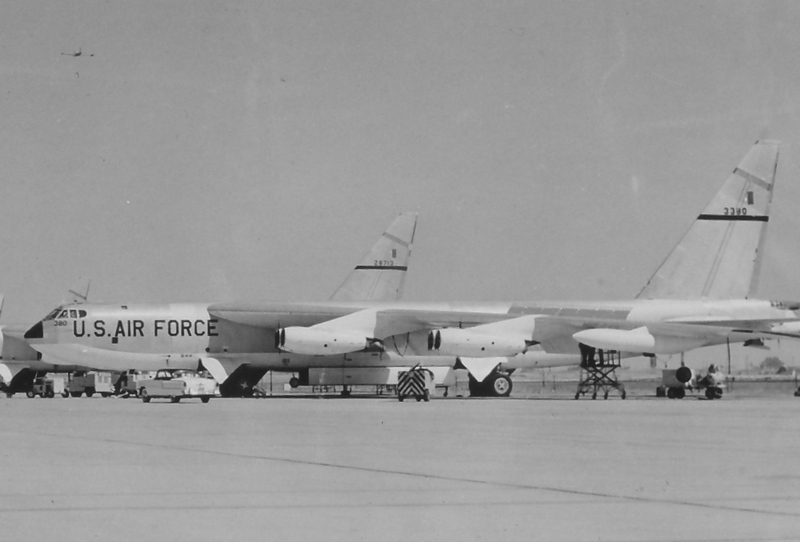 Their assignment was to practice ground-controlled intercepts of the B-52. Each F-100 made five passes at the B-52, flying at 34,000 feet (10,363 meters) over central New Mexico. Their Sidewinder infrared-seeking sensors would lock on to the heat of the B-52’s engines and give an audible signal to the fighter pilot that the target had been acquired. Safety precautions required that a circuit breaker be pulled and a firing switch be left in the off position. 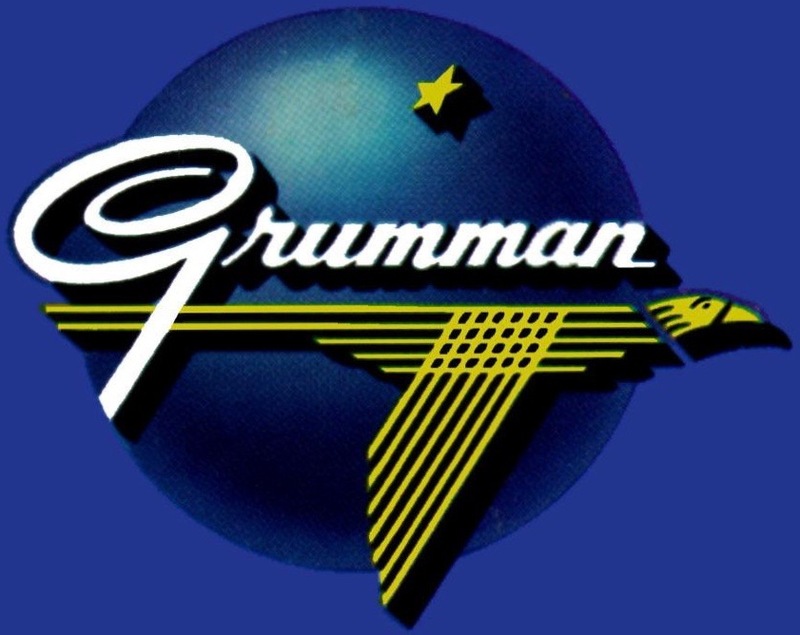 Before each pass, ground controllers had the pilots verify that the missiles were safed. 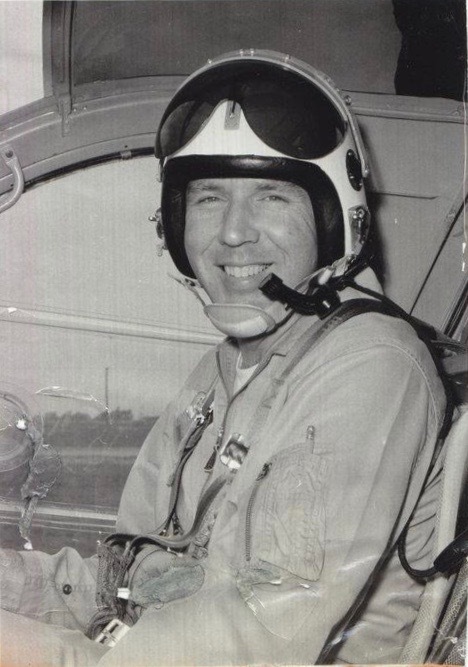 As the training session came to an end, Lieutenant van Scyoc, flying F-100A-20-NA Super Sabre 53-1662, announced, “OK, Wing, one more run then we’ll go home.” The seeker heads of his Sidewinders locked on to the B-52, but then one of the missiles fired. Van Scyoc radioed, “Look out! One of my missiles is loose!” Captain Blodgett heard the warning, but before he could begin evasive maneuvering, the Sidewinder impacted the inboard engine nacelle under the bomber’s left wing, blowing the wing completely off. The B-52 immediately rolled over and went into a spin. 52-380 disappeared into the clouds 10,000 feet (3,048 meters) below. 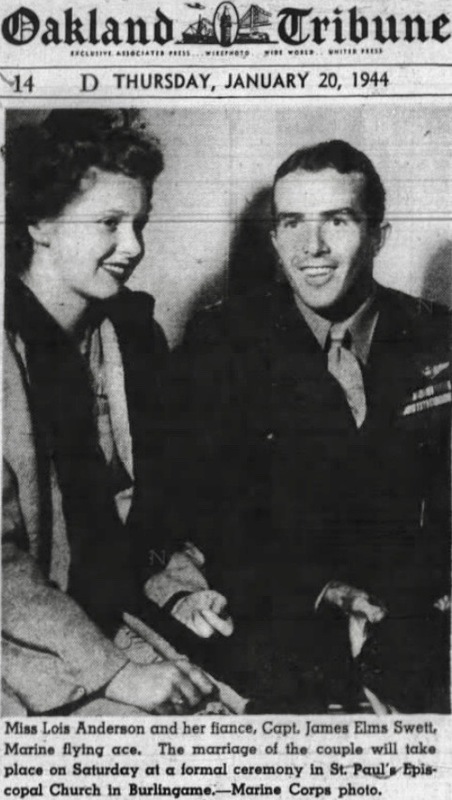 The co-pilot of Ciudad Juarez, Captain Ray C. Obel, immediately ejected. His ejection seat was thrown through a hatch opening in the cockpit ceiling. Because of the high altitude, this sudden opening in the fuselage resulted in explosive decompression. 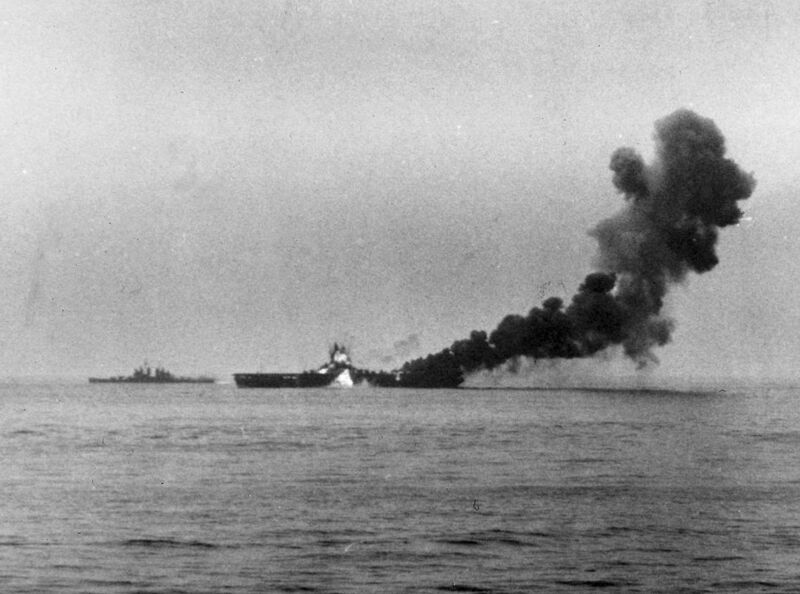 The crew chief, Staff Sergeant Manuel A. Mieras, had been standing on a crew ladder behind the pilots which led to the lower deck where the navigator and bombardier were located. Sergeant Mieras was sucked up through the hatch. His left leg was so badly injured that it later had to amputated. “I heard van Scyoc call “Look out! My missile’s fired.” We were on autopilot and I grabbed the controls just as the missile hit. 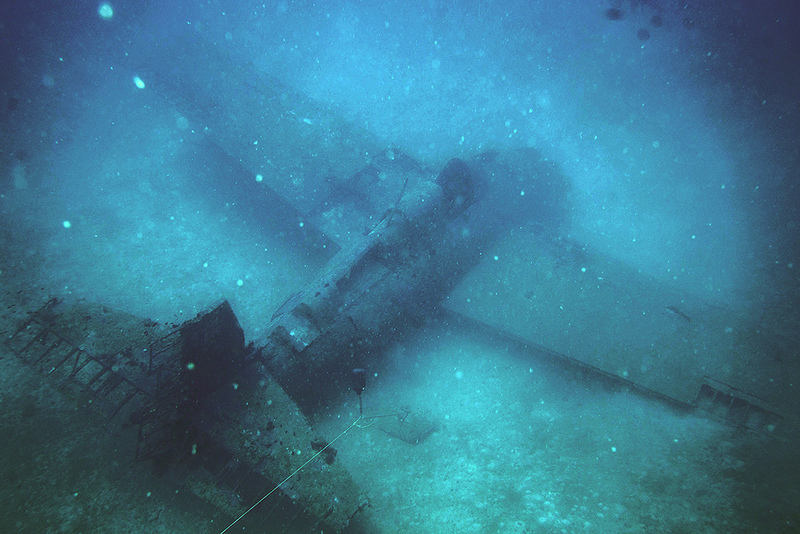 There was a tremendous shudder and the aircraft banked left steeply. Electrical equipment in the right side of the cockpit caught fire. My copilot ejected with the aircraft in a 90° bank and in all the confusion I didn’t realize he had gone. I tried to reach the alarm bell control between the two seats to order the crew to bail out, while holding the controls with my left hand to maintain full right aileron and rudder. I didn’t realize the wing had gone and the aircraft wasn’t responding at all; it began to spin down into the clouds and I still wasn’t sure that I had hit the alarm. Later, my crew chief said he had seen the red light flashing as he sat on the steps to the lower cabin. With g-forces building up tremendously, pinning me to my seat I could not raise my right hand from its position near the bail-out alarm but could move it sideways to the ejection handle. The hatch fired and the seat threw me up fifty feet with the B-52 at 600 knots. The slipstream tore off my helmet as I left the aircraft. There was another explosion and I went through a ball of fire — it felt like being in an oven. Immediately after that I went through a “bath” of JP-4 fuel as the fuel tanks had broken up in this second explosion. At least this put out the fire but now I was soaking wet with fuel and still on the ejection seat. Assuming a seat malfunction (they told me afterwards I was holding on to it) I reached out to unfasten the lap belt when suddenly I flew out of the seat. However, the inter-phone cord wrapped around my leg so now I was going down through the clouds with a 650 pound seat hooked to my leg. I thought it would rip my leg off and I managed to claw the cord free. By now I was falling in a cloud of debris — and a blizzard. I released my survival gear pack, which also automatically released the survival raft. This was suspended about 40 feet below me and, with all the updrafts in the clouds due to the bad weather it acted like a sail, pulling me round in a 180° arc. I thought, ‘If I hit the ground sideways, this is it!’ I couldn’t get to my knife to cut it free but I soon got out of the turbulence and began to fall straight. Ciudad Juarez impacted on Mount Taylor, an 11,305 foot (3,446 meter) stratovolcano northeast of Grants, New Mexico, and left a crater 75 feet (23 meters) deep. 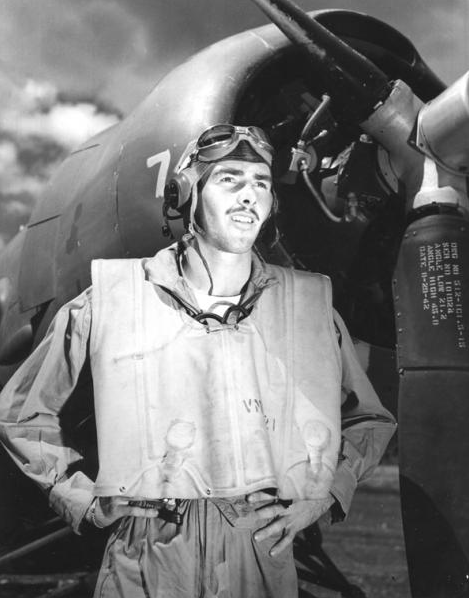 Captain Peter J. Gineris, navigator, Captain Stephen C. Carter, bombardier, and 1st Lieutenant Glenn V. Blair, electronic countermeasures, did not escape. Captain Blodgett suffered a fractured pelvis, Captain Obel, a broken back. 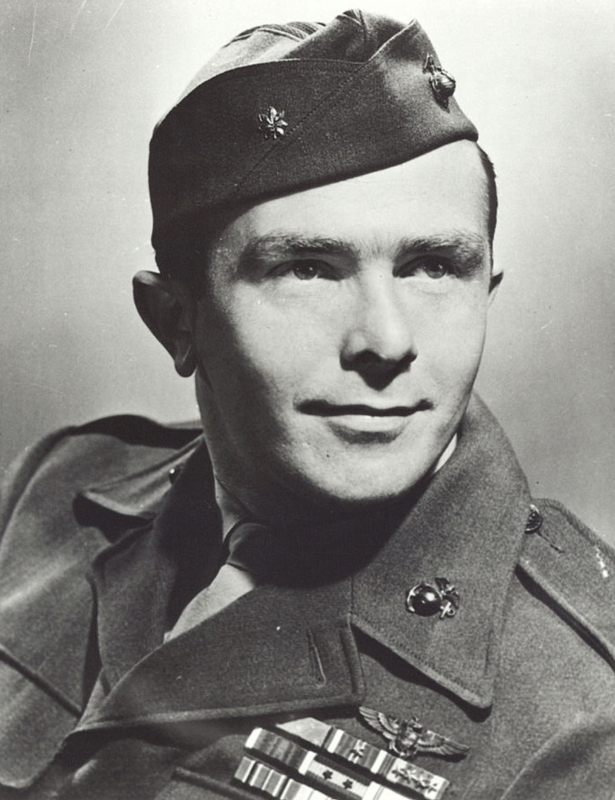 The tail gunner, Staff Sergeant Ray A. Singleton, was badly burned. Sergeant Singleton located Captain Blodgett and they were both rescued by helicopter later that day. It would be two days before Captain Obel and Sergeant Mieras were located. An investigation determined that moisture condensation inside a worn electrical plug had caused a short circuit which fired the Sidewinder. Lieutenant van Scyoc was completely exonerated of any blame for the accident. The AIM-9B Sidewinder was the first production version of the Raytheon Sidewinder 1A. It was 9 feet, 3.5 inches (2.832 meters) long with a diameter of 5 inches (12.7 centimeters). The span of the fins was 1 foot, 10 inches (55.9 centimeters). The AIM-9B weighed 155 pounds (70.3 kilograms). The missile was powered by a Thiokol Mk. 17 rocket engine which produced 4,000 pounds of thrust for 2.2 seconds. It could achieve a speed of Mach 1.7 over its launch speed, or about Mach 2.5. The maximum range was 2.9 miles (4.82 kilometers). It carried a 10 pound (4.54 kilogram) blast fragmentation warhead with an infrared detonator. The lethal range was approximately 30 feet (9.1 meters). The Sidewinder is named after a species of rattlesnake, Crotalus cerastes, a pit viper common in the southwest United States and northern Mexico. The snake uses a heat-sensing organ on top of its head to hunt. 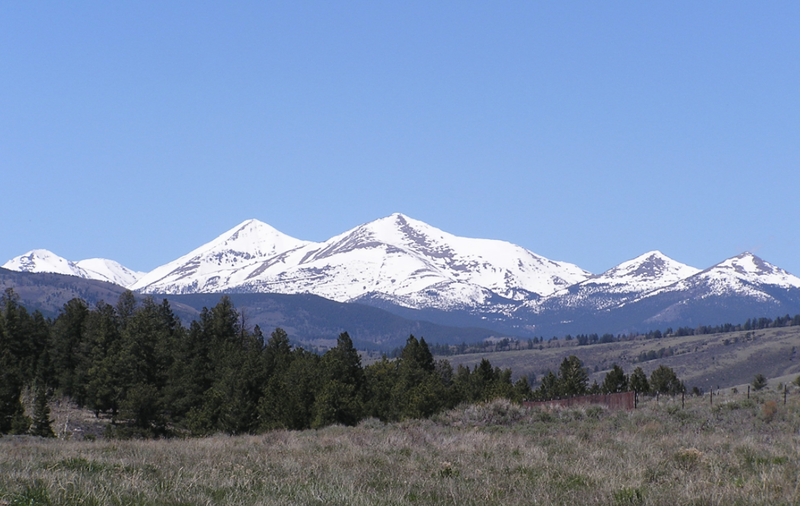 Mount Taylor, near Grants, New Mexico. 11,305 feet (3,664 meters). Major de Infanteria aviador António Jacinto da Silva Brito Pais and tenente de Engenharia José Manuel Sarmento de Beires, Serviço Aeronáutico Militar. 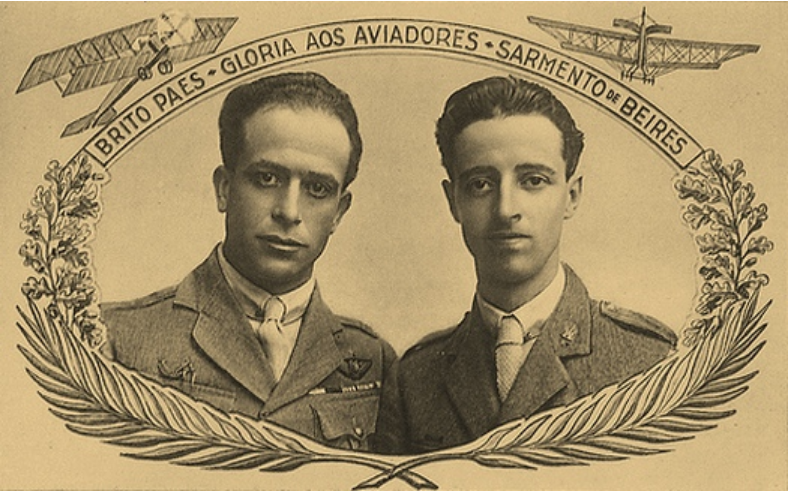 7 April 1924: At 6:02 a.m., local time, Major de Infanteria aviador António Jacinto da Silva Brito Pais and tenente de Engenharia José Manuel Sarmento de Beires departed Vila Nova Milfontes on the western coast of Portugal, enroute to Macau, Portuguese colony on the southeast coast of China. This was intended as a step toward an eventual around-the-world flight, a reminder of the Portuguese voyages of discovery of the 15th and 16th centuries. Bréguet Type 16 Bn. 2, Pátria. Stage 1: 7 April, Vila Nova Milfontes, Portugal, to Málaga, Andalusia, Spain. 4 hours, 30 minutes (4:30). Stage 2: 9 April, Málaga to Oran, French Algeria. 2:45. Stage 3: 12 April, Oran to Tunis, French Tunisia. 6:50. Stage 4: 14 April, Tunis to Tripoli, Italian Libya. 6:50. Stage 5: 16 April, Tripoli to Al-Khums, Italian Libya. 4:00. Stage 6: 18 April, Al-Khums to Benghazi, Italian Libya. 6:18. Stage 7: 20 April, Benghazi to Cairo, Kingdom of Egypt. 9:15. Stage 8: 23 April, Cairo to Riyaq, Greater Lebanon. 5:10. Stage 9: 26 April, Riyaq to Baghdad, Kingdom of Iraq. 6:00. Stage 10: 27 April, Baghdad to Bushehr, Persia. 6:05. Stage 11: 2 May, Bushehr to Bandar Abbas, Persia. 4:31. Stage 12: 3 May, Bandar Abbas to Chabahar, Persia. 3:30. Stage 13: 4 May, Chabahar to Karachi, Sindh. 6:29. Stage 14: 7 May, Karachi to N. 26° 13′, E. 72° 58″ (near Pipar Road, Jodhpur, Rajputana). 5:20. On 7 May, Pátria departed Karachi (in what is now Pakistan) at 6:18 a.m., enroute to Agra, British India. 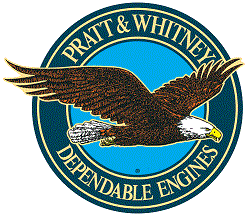 During the flight, water used as engine coolant began leaking from the radiator and the engine temperature started to rise, requiring a reduction in power. Eventually, the airplane was unable to maintain altitude and the crew began a gradual descent. Near the village of Pipar Road, they sighted an open field that seemed suitable for landing. Just before touchdown the airplane was caught by a gust of wind and crashed. The crew received only minor injuries, but their airplane was heavily damaged. It was impractical to repair so far from a major city, so it was abandoned. Brito Pais, Sarmento de Beires and Gouveia walked back to Karachi, where they continued their journey by train. The wreck of Pátria was eventually shipped back to Portugal. Its Renault 12 Fe V-12 engine is in the collection of the Museo do Ar at Base Aérea de Sintra, Sintra, Portugal. 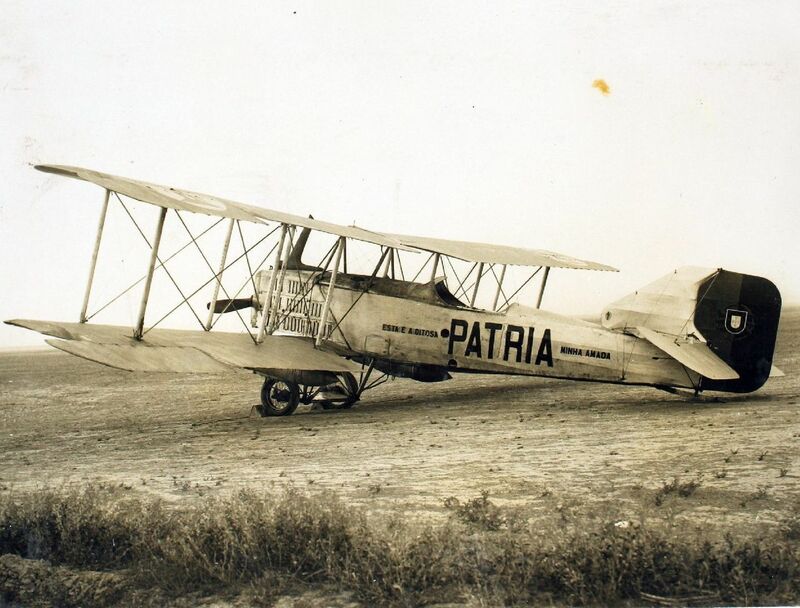 De Havilland DH.9A Pátria II. Several weeks later, they acquired another airplane, a 1920 de Havilland DH.9A powered by a Liberty L-12 engine, which they named Pátria II. Pátria II could carry only two, so Gouveia had to continue by train. 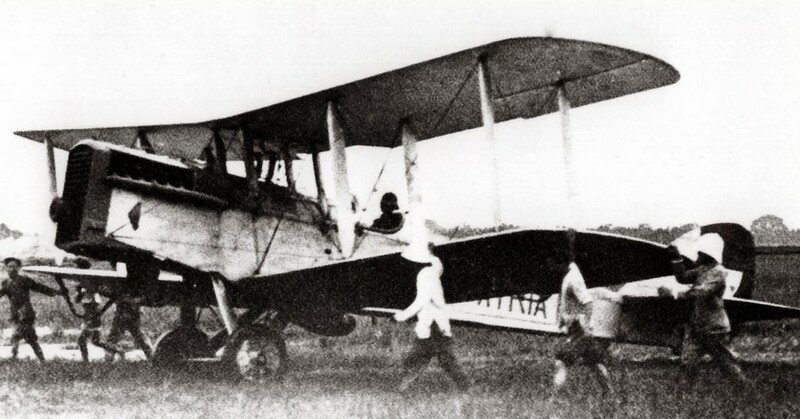 In 10 additional stages, Brito Pais and Sarmento de Beires finally arrived at Macau, 20 June 1924, but after overflying the city, crashed inside Chinese territory. The two aviators, again not seriously hurt, had to walk until they reached the British colony of Hong Kong. Their journey covered 16,760 kilometers (10,414 miles) in 117 hours, 41 minutes flight time. The airplane used for the first half of this journey was an Avion Bréguet Type 16 Bn. 2 (also designated Bre. 16 Bn. 2), a military aircraft produced by France. The airplane had been purchased by the government of Portugal for a series of long-range flights based on the recommendation of Brito Pais and Sarmento de Beres, both officers in the Serviço Aeronáutico Militar, Portugal’s military air service. It was built in France by the Société Anonyme des Ateliers d’Aviation Louis Bréguet and shipped, knocked down, to Amadora, near Lisbon, where it was assembled. It made its first flight 22 September 1921. In November, the new airplane was seriously damaged in a storm. Repairs were not begun until June 1922. On 28 June 1923, the Bre. 16 crashed, but was again repaired and made its next flight 26 October 1923. 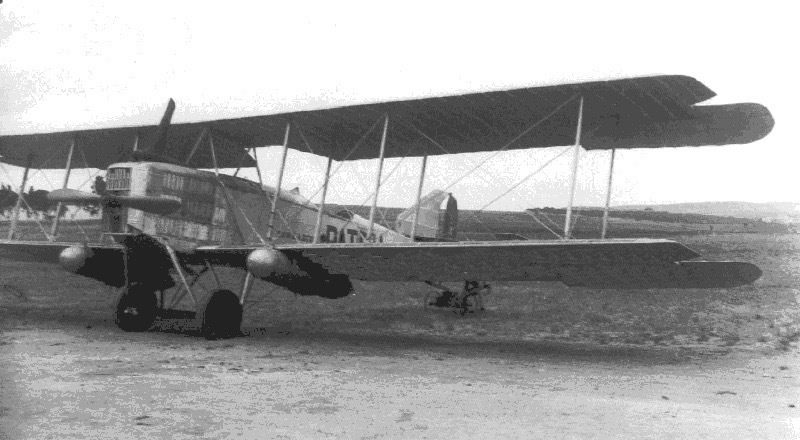 The Bréguet Type 16 Bn. 2 is a single-engine, two-place, three-bay biplane, designed toward the end of World War I as a night bomber. 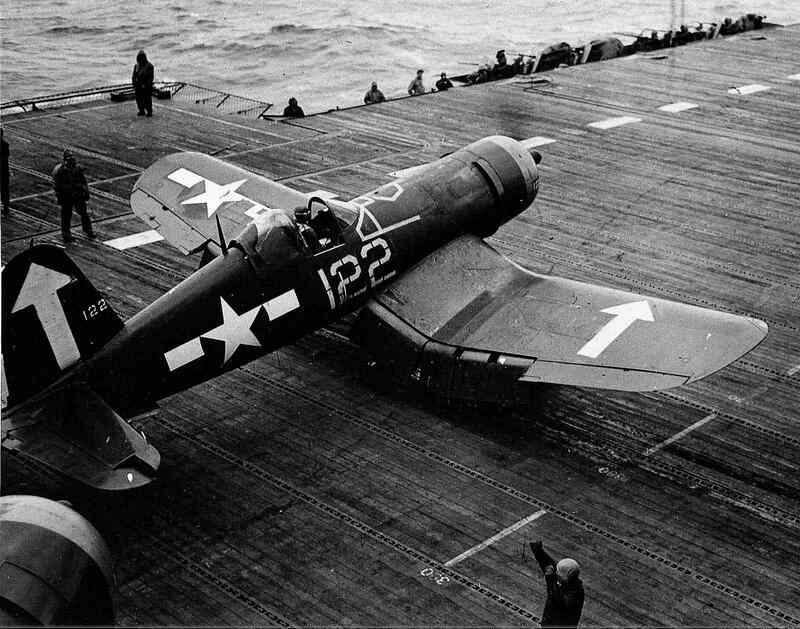 It had fixed, two-wheel landing gear with a tail skid. The Bre. 16 Bn. 2 was 9.550 meters (31 feet, 4 inches) long, with a wingspan of 17.000 meters (55 feet, 9.3 inches), and chord of 2.350 meters (7 feet, 8.5 inches). The wings were of equal span. The upper wing was staggered slightly behind lower wing. Both upper and lower wings are equipped with ailerons. The wings are swept aft approximately 3°. The lower wing has no dihedral, while the upper wing has approximately 3° dihedral. Wing area is variously reported as 72, 73.5 or 75.50 square meters (775, 791.1 or 812.68 square feet). The bomber had an empty weight of 1,268 kilograms (2,862 pounds) and gross weight of 2,398 kilograms (5,287 pounds). 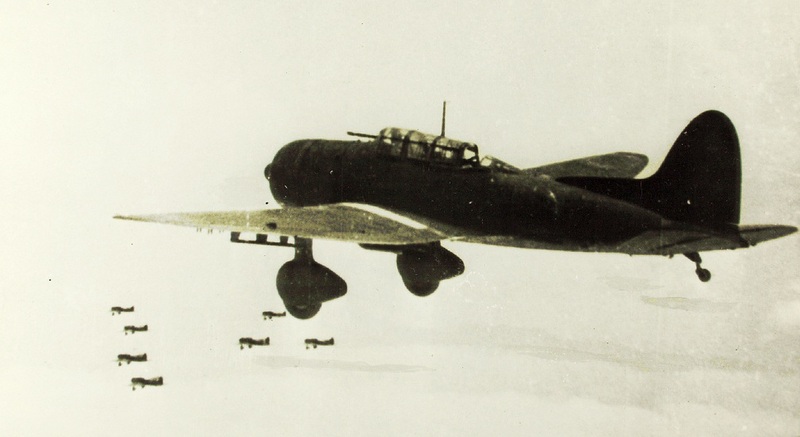 Bréguet informed Brito Pais and Sarmento de Beires that the Type 16’s structure was capable of safely supporting 2,719.5 kilograms (5,995.5 pounds) total weight. The Type 16 was powered by a water-cooled, normally aspirated, 22.089 liter (1,347.973 cubic inch Renault 12 Fe, a 50° single-overhead-cam, direct-drive V-12 engine with 2 valves per cylinder and a compression ratio of 5.0:1. The 12 Fe produced 305 chavel vapeur (301 horsepower) at 1,550 r.p.m., and 312 chavel vapeur (308 horsepower) at 1,600 r.p.m. 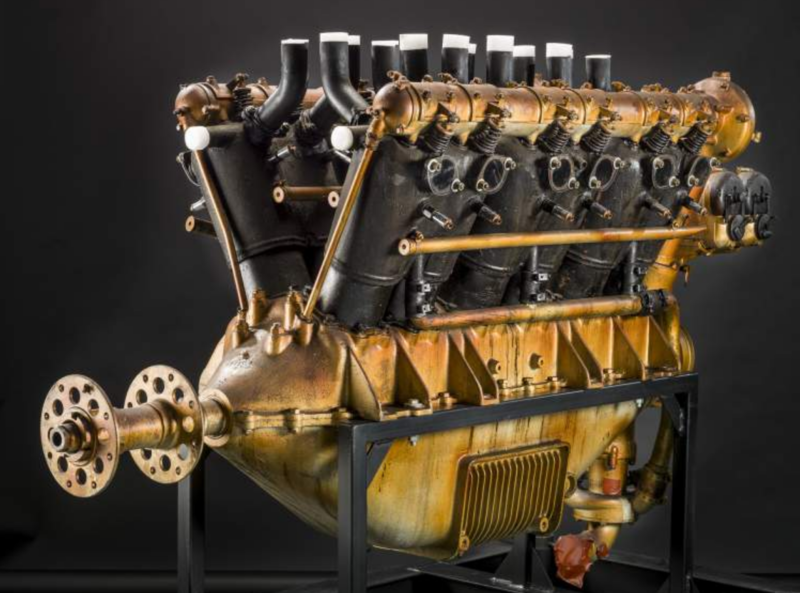 The engine was 2.057 meters (6 feet, 9 inches) long, 1.124 meters (3 feet, 8.25 inches) wide and 1.372 meters (3 feet, 8.8 inches) high. It weighed 369 kilograms (813.5 pounds). The Bre. 16 Bn. 2 had a cruise speed of 140 kilometers per hour (87 miles per hour) and maximum speed of 160 kilometers per hour (99 miles per hour) at Sea Level. Its service ceiling was 4,600 meters (15,092 feet), and normal range was 900 kilometers (559 miles). 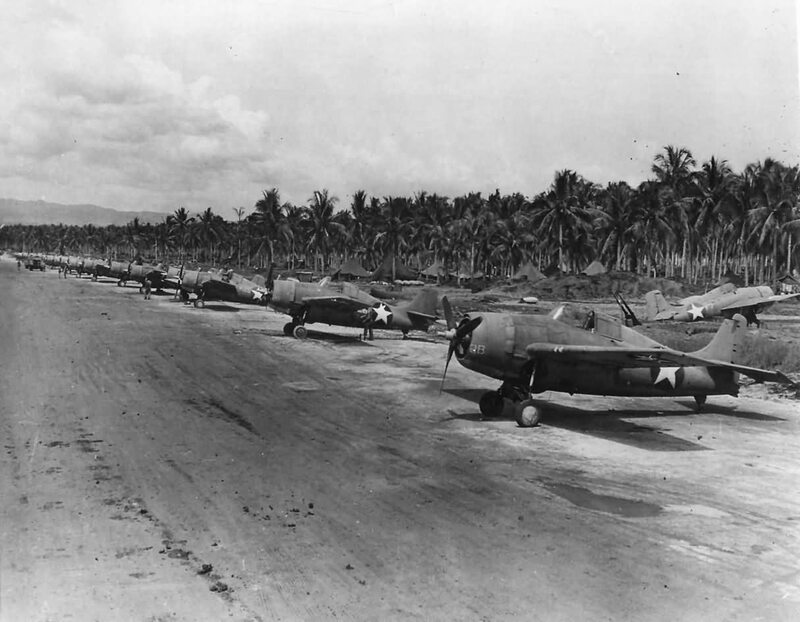 Approximately 200 Type 16 airplanes were built.